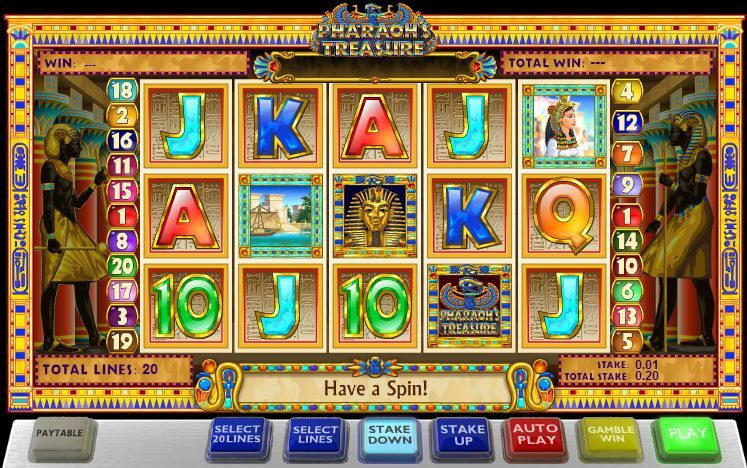 Ploughing a similar furrow to virtually every other slot manufacturer on the net, slot developer Ash Gaming's Egyptian-themed Pharaoh's Treasure game evokes an era of ankhs, mummies and Tutankhamen's tomb. The 5-reel, 20-payline online slot has it all: bonus rounds, lots of action, and even a progressive jackpot. Betting starts at $0.05, with a maximum bet of $200 per spin. On the reels the symbols are fairly Egypt-standard: a Sphinx, a Cleopatra symbol, an Egyptian temple, 10-through-Ace symbols and a Scarab. The reels spin with a nice action, and in the background there are some nice 'casino' sounds to accompany the gameplay. The Wild is the Pharaoh's Treasure logo, and it substitutes for all symbols other than the Scatter and Tut Bonus icon. Five Wilds, meanwhile, pays a 3,000-coin jackpot. 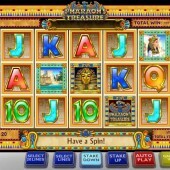 Hit three or more Tutankhamen gold masks across the reels anywhere and you will trigger the bonus game. Essentially the first feature is a Pick 'em bonus: you will enter the Pharaoh's tomb and be presented with various treasures, all highlighted by a shining torch in the darkness. Click the mouse on where you think the treasure is hidden and the torch will show up that section of the room. The more Scatters you landed in order to initially trigger the round, the more chances you have to find treasure. However, pick three gold masks in your quest for treasure and you will bag the game's big progressive jackpot! There's a more standard free spins round to be activated if you land three or more Scarab Beetles on the reels. 10 spins are awarded with a juicy 3x multiplier attached. Ash Gaming have hit the mark with this game. Two bonus rounds and a progressive jackpot puts it in a league with IGT's Cleopatra slot or Novomatic's classic adventure-themed Book of Ra game - big-hitting rivals, to be sure. The interface is fun, graphics bright and simple, and the bonus rounds tend to trigger often. Get involved!